Our new parish trip to Winchester will take place on Monday 17th December. Please contact Daniel Engeli (contact details below). For all of you have signed up, here is a summary of the itinerary. Inspired by our recent parish trip to Ely Cathedral , we’d like to invite you to join us on a new parish trip to Winchester. 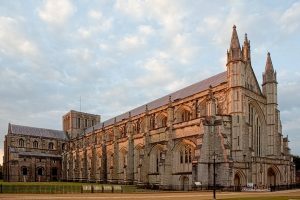 12.00 a.m. – Guided tour of the breath-taking Winchester Cathedral , famous for having the longest nave of any Gothic cathedral in Europe. Afternoon- Chance to visit either the famous Christmas Market or the Great Hall in Winchester, one of the finest surviving medieval halls, dating back to the thirteenth century. The Great Hall houses the Round Table ,linked to the legends of King Arthur. 18.23 p.m. arrive back at London Waterloo. Train ticket– We propose to purchase a group ticket for approximately £24 per person.